Yes, indeed. The Cheese Traveler specializes in creating uniquely designed cheese wedding cakes for bride and/or grooms cakes. Check out our Pinterest page for ideas of what our cheesemongers can do for you. Here we have featured a four-tiered cheese-cake selected for style and textures that, when taken apart, becomes a four-cheese dessert course. Adorning the cake are white roses and spray roses to match the wedding decor and a cascade of candy-sweet muscat grapes. Cheese-cakes can be purchased on their own, or for an additional fee, you can have a cheesemonger at your event to break down and serve the cheese to guests. 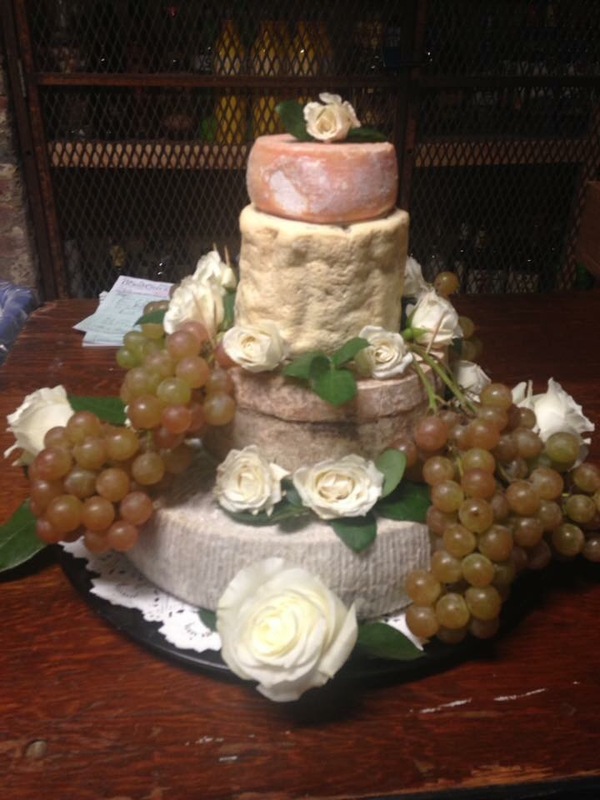 Cheese wedding cakes are perfect for any season. They can also be created for birthdays, retirement parties, or other events. Pricing varies. Call or email for additional details.